When I went out the other day to the Rachel Carson National Wildlife Refuge headquarters trail looking for landscape photos for my “For the love of landscape” posts, I was, of course, captivated by the fall litter on the forest floor. It was a moody day, with the sun just beginning to break through clouds away off to the south. It had been raining up to an hour ago. The light in the forest was subdued, and everything was still damp. Between the light and the wet, the colors simply glowed. I framed a lot images that were simply about color and light and texture and shape. 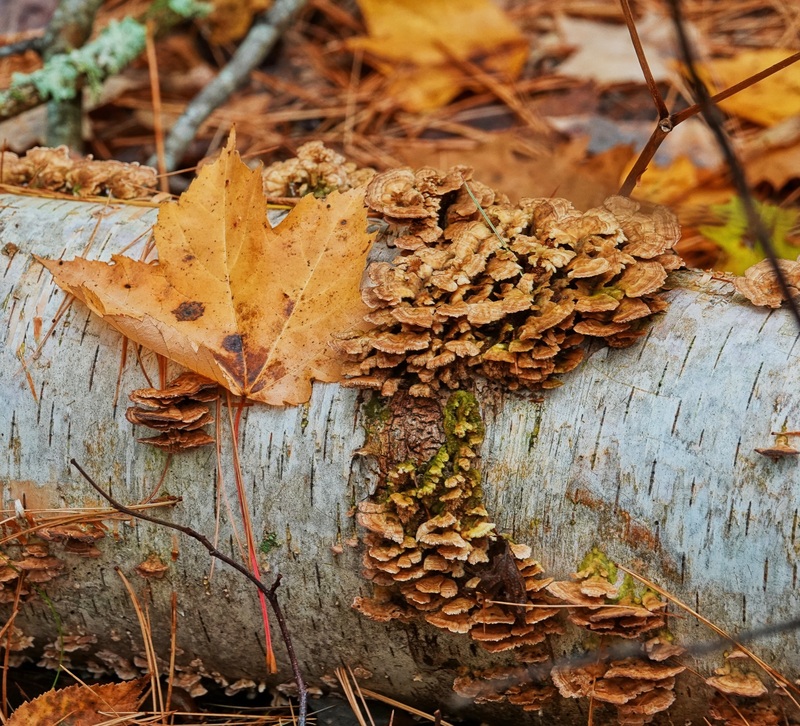 This ladder of scale fungi on the fallen birch log, and the brown maple leaf beside it is a good example. A quiet image of nothing in particular that I find still very satisfying. Sony RX10iv at 300mm equivalent. Program mode. Processed in Polarr. 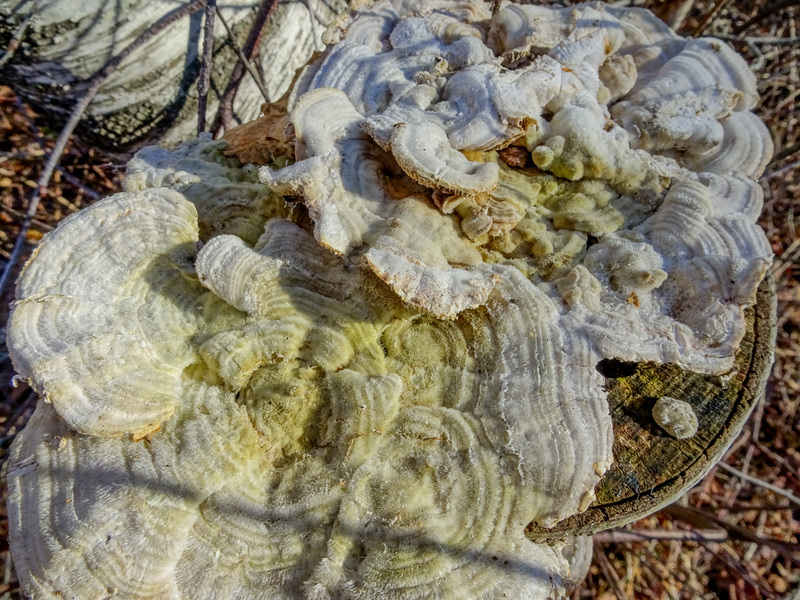 I have walked right by this rather amazing cap of fungi growing on a birch stump at Laudholm Farms hundreds of times. Of course, in summer, it is somewhat hidden by the brush around the base of the tree…still I am surprised that I did not find it before this. The December light the other day helped. The low angle illuminated things not ordinarily seen. This cap is old enough to have picked up some algae. Unlike its role in lichen, with is a compound organism, I think the algae here is just in symbiotic relationship with the fungus. 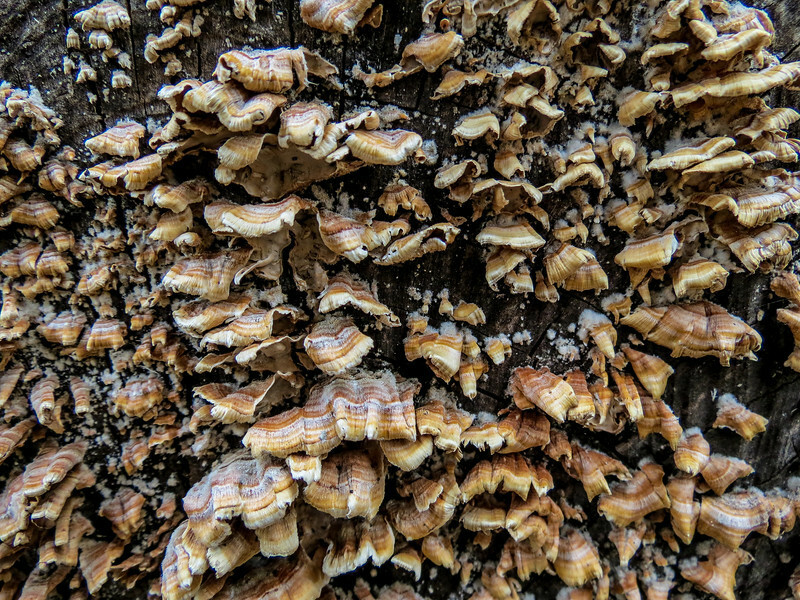 What caught my eye, and what is still of primary interest to me in the image, is the texture of the fungi. The tiny hair like structures on the surface caught the light and made the fungus glisten. And then there is the form of the thing. I find it fascinating. Sony HX90V at 24mm equivalent field of view. In-camera HDR. Nominal exposure: 1/250th @ ISO 80 @ f5.6. (Program shift used to increase depth of field.). Processed in Lightroom. 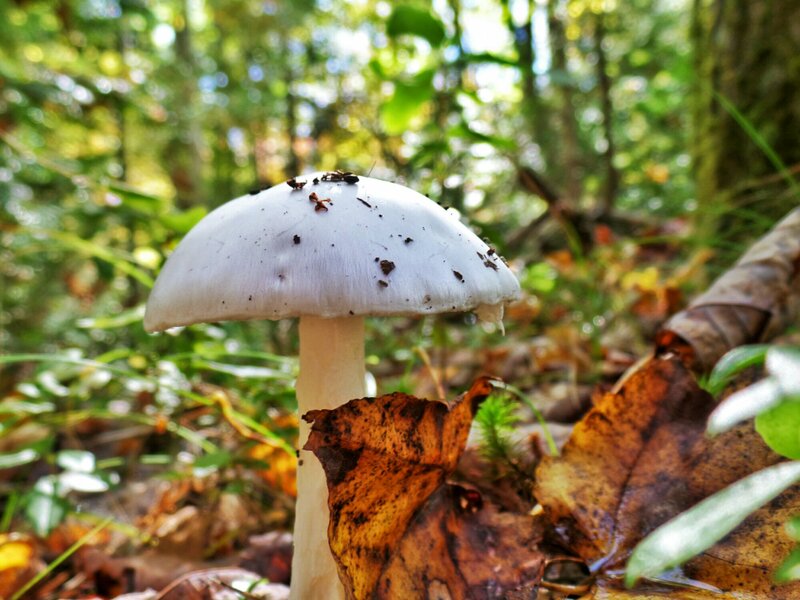 I am always fascinated by the mushrooms of late summer and fall in our New England forests. Actually I am fascinated by mushrooms any time of year. 🙂 I found this bright specimen, which looks to me like a little soldier, along the Learning Trail at Emmon’s Preserve in Kennebunkport ME. Samsung Smart Camera WB800F. Macro mode (28mm). f2.9 @ 1/45th @ ISO 100. Processed in Snapseed on the Nexus 7. 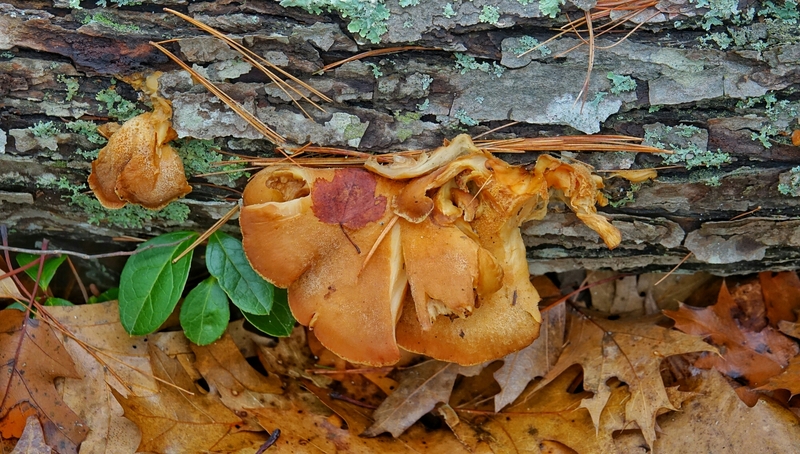 Though mushrooms of some kind are out pretty much all summer, I always associate the real abundance of fungi on the forest floor with fall. 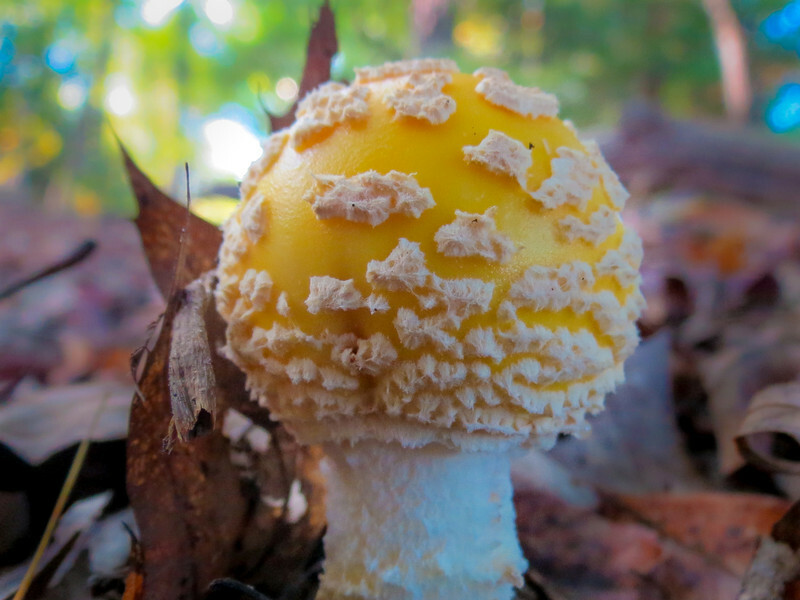 This emerging Fly Amanita, found along the Mousam River at OId Falls, is presented here a little over life-sized. Unlike some of its fellow deadly mushrooms, this one has always looked as poisonous as it really is to me. The low angle shot was facilitated by the flip out LCD on the Canon SX40HS, and the close view by the 24mm macro setting plus 1.5x digital tel-converter function. Canon SX40HS. Program with iContrast and –1/3EV exposure compensation. f2.7 @ 1/30th @ ISO 500. A real forest floor exposure. I would have used the flash if I had been thinking. Processed in Lightroom for intensity, clarity, and sharpness. A bit of Local Adjustment Brush to darken and soften the background slightly. I mentioned in yesterday’s post that my Saturday morning photo-prowl, despite the unpromising weather and season, turned up a few good shots. For one thing I came across a pile of rotting logs beside the Kennebunk Bridle Path that were covered in interesting fungi. I have been experimenting with using the digital tel-extender function with macro at the wide end of the zoom, which gives me considerably larger than life size views. The light was actually pretty ideal for this kind of macro work…even and diffused, with very little shadow to deal with. 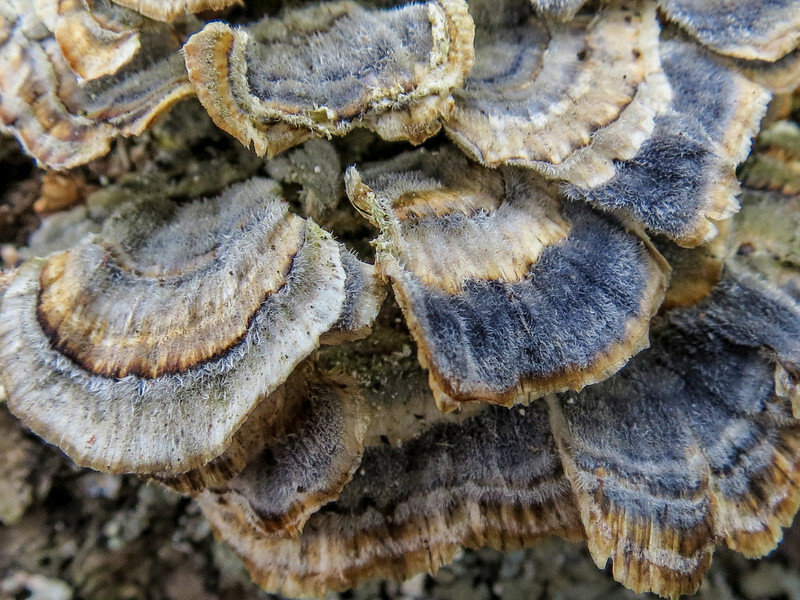 The first image is, after some research this morning, False Turkey Tail Mushroom. You can tell by the smooth, creamy, undersurface. Growing right next to it…actually over one log…was a nice patch of real Turkey Tail Mushroom. 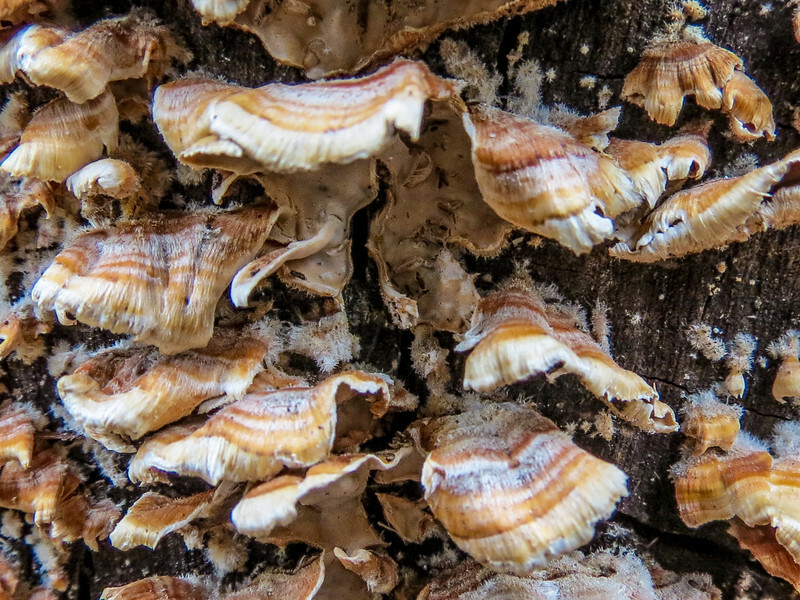 Though I did not know it until my research this morning (aimed mostly at putting a name to the mushrooms) Turkey Tail Mushroom is the center of a lot of medical research today. 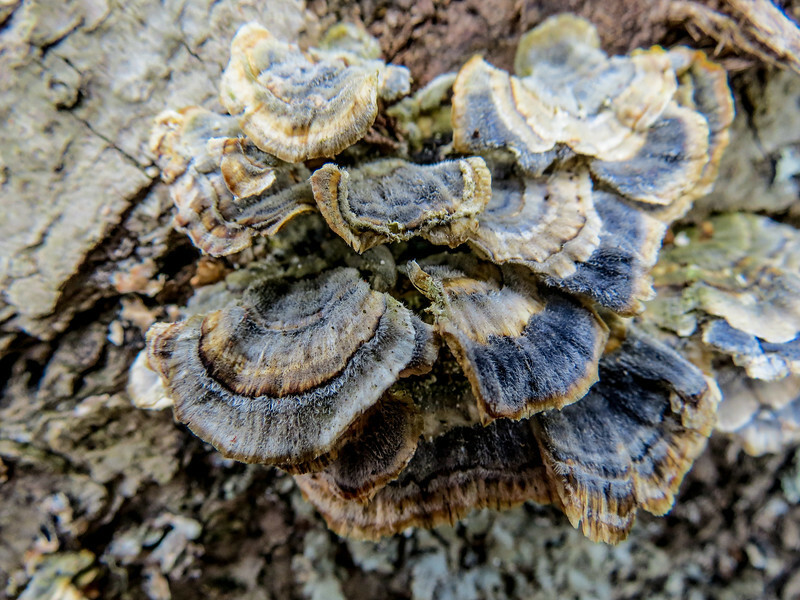 You can even buy Turkey Tail Mushroom extract on-line. 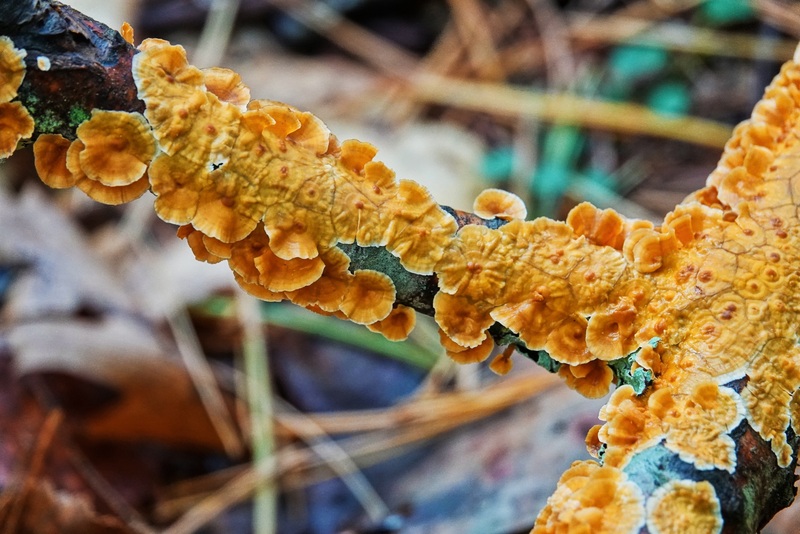 Apparently there is evidence that compounds in the Turkey Tail kill cancer cells, or at least support the immune system in doing so, and it has been used for cancers from breast to prostrate. Interesting. Canon SX40HS. Program with iContrast and –1/3EV exposure compensation. 24mm equivalent field of view and macro…plus 2x digital tel-extender function. Both shots were from less than a centimeter away from the closest fungi. 1) f4 @ 1/80th @ ISO 200. 2) f4 @ 1/160th @ ISO 160. And just for fun, two more shots without the dte function kicked in, which perhaps show the growth habit a bit more clearly. Another shot from Saco Heath, along the boardwalk on the way out through the forest. 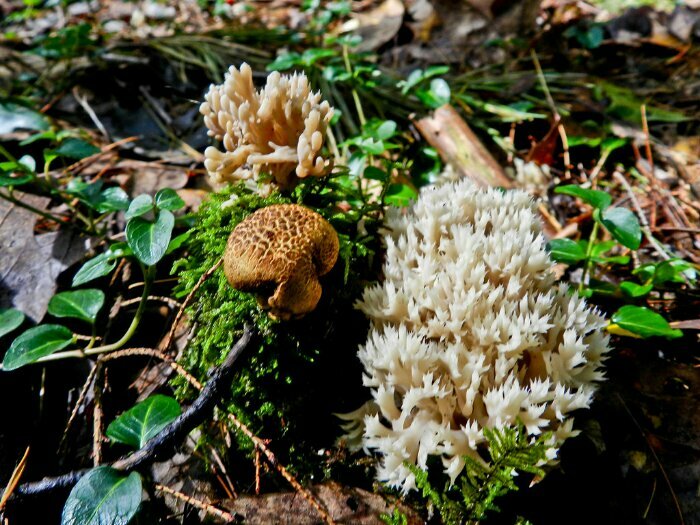 There was a great variety of fungi along the path. This little grouping in the moss caught my eye both going in and coming out. Coming out it was in a little patch of sun. Bonus! Nikon Coolpix P500 in close up mode. 32mm equivalent field of view, f3.7 @ 1/60th @ ISO 160. 6/19/2011: Lichen Flowers: Happy Sunday! As I mentioned in my extended essay on shooting in the rain (Acadia from under an umbrella…), one of the advantages of prevailing mist and falling water is that you tend (or at least I tend) to look at what is close to hand more carefully…and, of course, the water on everything adds a glisten that catches the eye. I have always been fascinated by moss and lichen, though I know next to nothing about it. I like the forms it takes, the colors (or lack thereof) and the textures. 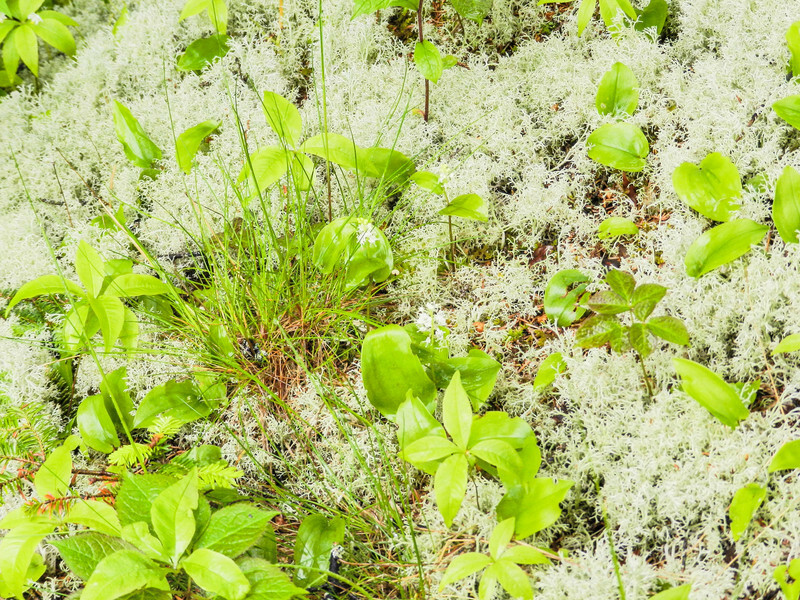 The northern coast of Maine has both moss and lichen in abundance. This whitish, antlered lichen forms large dense beads from the seaside path to the tops of the mountains of Acadia. It generally hosts a variety of other plants, but only a few hardy individuals, well spaced, as below. I had, however, never seen the flowers, if that is the proper word for these reproductive parts of this particular lichen, until my day of photographing in the rain. Nikon Coolpix P500 in 1) Close Up Scene mode, 32mm equivalent field of view, f3.7 @ 1/60th @ ISO 160. 2) 100mm equivalent, f4.6 @ 1/60th @ ISO 160 Program. And, of the Sunday thought, that matter of looking close come to mind. Though we Christians don’t give “paying attention” as much attention as some other religions, I certainly find that a sense of reverence has to be grounded in attention…in looking closely at life…in seeing and celebrating all the works of creation, from the most grand landscape to the smallest lichen on the forest floor. And when you do pay attention, you see the most amazing things. 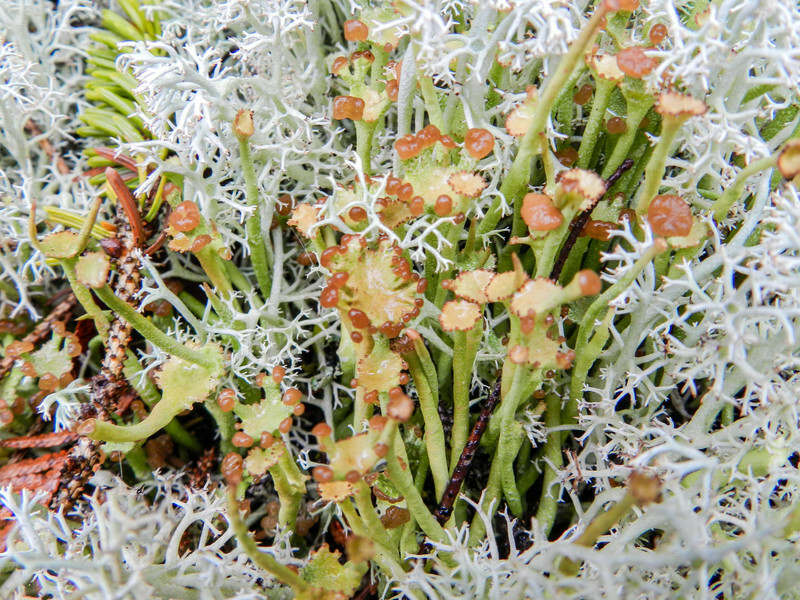 I mean, how unlikely are those flowers, or whatever lichen have, and how unlikely is the lichen itself…a fungus and an alga living entwined, supporting and feeding each other? The infinite forms of creation is enough to keep me reverent…and entertained…even on a rainy day. Even on a Sunday. Especially on a Sunday! While out looking for Lady Slippers in one of the two places where I know they grow last Saturday, I came across these…growing on a dead birch sapling in the deep forest. 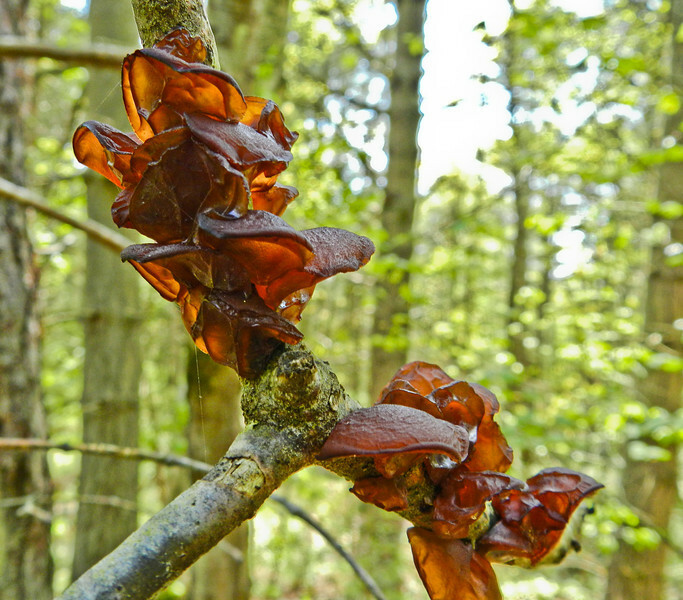 Never seen the like, but some research on Google, and a not so inspired guess considering how they look, identified them as Jelly Fungus. Honestly…you just could not make these things up! 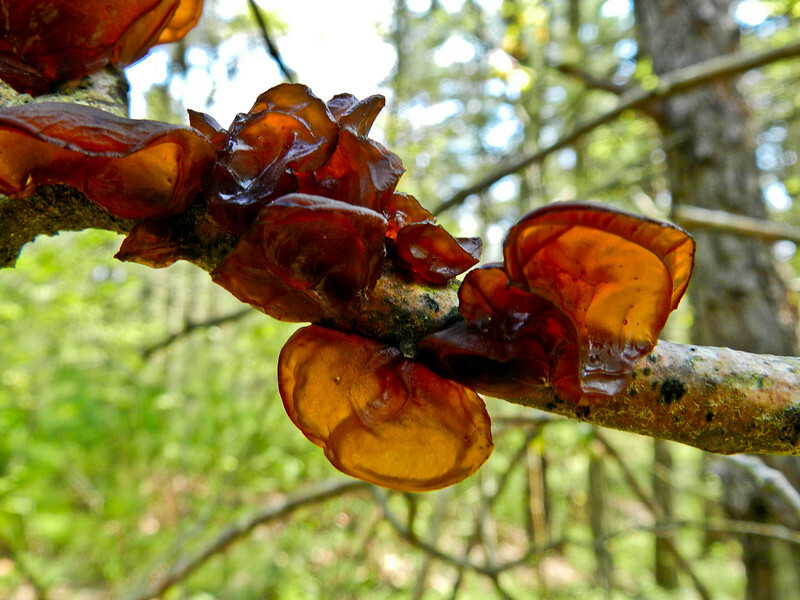 It is called Witches’ Butter in eastern Europe, and compounds extracted from it have proven effective in stopping the growth of certain cancers in white mice. Stranger and stranger. Nikon Coolpix P500 in Close Up mode (macro) at 32mm equivalent field of view. 1) f3.7 @ 1/100th @ ISO 160. 2) 1/80th. Processed in Lightroom for Clarity and Sharpness. #2 was cropped from the left for composition. Oh…and the Lady Slippers were just poking through the ground.